Last night in Cincinnati, a rock-star author visited Joseph Beth Booksellers (our local indie) to a huge crowd. Kristan, Stephanie, and Sarah were close to the front so we had a pretty good view. 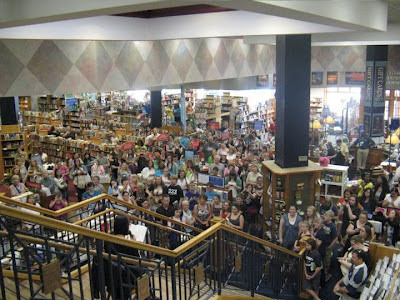 We hadn't been to such a big signing before, and while we think it's great for Veronica Roth (and JB) to have such a turn-out, we kind of prefer the smaller events. It's awesome to get to interact with the authors and chat. Big events sort of negate that option. But the atmosphere was fantastic, and it was great to see lots of teens out in the crowd asking questions. After reading for fifteen minutes, Veronica answered questions. We loved her answer about the factions: "I think bravery is important. Fear keeps people from doing good things for each other." And her philosophy on characters: "No one is safe. Ever." That's bravery indeed!! Proof that John Green's influence is everywhere: When Veronica was asked what she's reading right now, she mentioned THE FAULT IN OUR STARS, and the audience cheered and clapped. She also said she reads a lot of books that aren't out yet, like Leigh Bardugo's SHADOW AND BONE. (We can't wait for this one too! Go here and pre-order, get a free map). We Heart YA: l. to r. Sarah, Kristan, Stephanie and Veronica Roth! While we waited to get some books signed and photos taken, we grabbed some dinner at Bronte Cafe, which is right in the bookstore. They have the BEST food. So yummy. Except...would you drink something this green?? I so wanted to come to that signing!! Looks like it was an incredible show of people! I have to say, as a former Cincinnatian (although I guess I will always be one) I am feeling so much pride not only for my city, books and reading and indie stores. It's great to see so many people from my hometown get so excited for a book, particularly a young adult book! And the icing of this awesome cake is that it was an indie bookstore that hosted the event. KEEP READING CINCINNATI! And thanks to WeHeartYA for the recap! This looks like SUCH an awesome event!! I saw her briefly at RT Convention but it was a huge line so it was pretty crazy! Great recap for all of us who didn't get an awesome event with her nearby! @kaye...hey girl! Still can't get over how young she is. Too cool for school. I wish I had gone to GRRM's signing in Indy. Next time around (in five years or so?!?) Yes, post your pics!! @margot...thanks so much for commenting! It was a great turnout...I'm proud of Cincy too! JosephBeth is tops! @jamie...thanks for commenting! yes, it was pretty amazing. I still can't believe it when I look at that picture of the crowd! Fun!! I would love to go to one of Veronica's signings. I just found your blog and was enjoying looking through the posts and saw this one. My daughter and I were at that signing, too. (In fact, she found the back of her head in one of your pictures.) It was a great signing! @Heather...so glad you enjoy the blog! We just found your comment hiding in moderation so sorry it didn't post straight away. It was a fantastic signing and now I keep finding myself looking for people to talk to about INSURGENT. I read faster than the other WHYA girls. :) Thanks for commenting!